How did the picture and audio of this “Collector’s Edition” compare to the movie-only DVD? Both looked and sounded identical because they were identical. DVD One simply rehashes everything on the old release; the set adds a second platter but the movie disc remains absolutely identical. While that prior disc included no extras beyond trailers, the CE comes with a documentary called Common Ground: Under Construction Notes. This one-hour, 27-minute and 39-second piece mixes behind the scenes elements and interviews. We find notes from director Alejandro Gonzalez Inarritu, director of photography Rodrigo Prieto, “B” camera operator Berto, producer John Kilik, 1st AD Sebastian Silva, acting coach Hiam Abbas, production designer Brigitte Broch, sound mixer Jose Antonio Garcia, DJ Shinichi Osawa, composer Gustavo Santaolalla, sound designer Martin Hernandez, editor Stephen Mirrione, special effects technician James Bomalick, line producer Tita Lombardo, extra Ruben Alcantara, sign language translator/coach Mariko Takamura, and actors Mohammed Akhzam, Said Tarchani, Gael Garcia Bernal, Adriana Barraza, Elle Fanning, Nathan Gamble, Sfia Ait Benboullah, Rinko Kikuchi, and Michael Pena. For “Ground”, elements from the various sets strongly dominate. Even the interview segments come on the fly during production, so don’t expect this to present a concise, start to finish examination of the movie’s creation. However, while “Ground” may lack the usual narrative development, it compensates with a nice “fly on the wall” feel. We learn a reasonable amount about all the different aspects of the shoot and definitely don’t get a happy-happy view of the flick. Indeed, “Ground” may provide the grumpiest “making of” documentary I’ve ever seen. Inarritu constantly moans about the difficuly of his job and gripes about various problems the production encounters. That side of things sounds like it could become annoying, but instead it means that “Ground” seems more real. At the very least, it’s a nice break from the usual fluffy featurette. “Ground” never quite becomes a great program, but it’s a good one. DVD One opens with Previews for Black Snake Moan, Perfume: The Story of a Murderer, Flags Of Our Fathers, and Things We Lost In the Fire. These also appear in the “Previews” area along with a promo for An Inconvenient Truth. The disc tosses in the trailer for Babel as well. 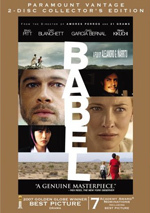 Babel follows such an interesting path that it seems open for the sort of examination that comes with DVD supplements. 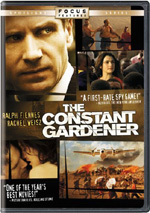 This is a rich, engrossing film that keeps us alert and occupied. The DVD offers excellent picture along with decent audio and a pretty interesting documentary. While I very much like Babel as a film, I can only endorse this Special Collector’s Edition to those who don’t already own the original DVD – and even then it’s an iffy endorsement. The two discs offer identical picture and audio, so the extra $5 for this one’s list price goes solely for the documentary. It’s worth it if you don’t have the prior release, but I definitely can’t recommend a double-dip solely on the merits of the supplements.